Starring Mark Pickford, William Haines, Walter James, Gordon Griffith, Carlo Shipa, Spec O'Donnall, Vota Vale. Directed by William Beaudine. (1925/94 min). Starring Mary Pickford, Jack Standing, Lottie Pickford, Gertrude Norman, Russell Bassett, Jack Pickford, Milton Berle (supposedly). Directed by James Kirkwood. (1915/94 min). 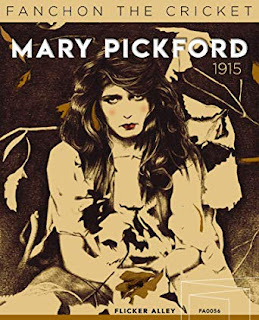 According to the press release, these two films are the first of several restored Mary Pickford films Flicker Alley plans to bring home on Blu-Ray. One is far more entertaining than the other, but from a historical standpoint, both are worth checking out and the transfers are outstanding. 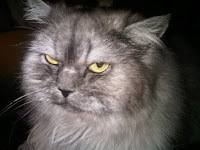 "...and I'll kill you last." Fanchon the Cricket is far less engaging. While visually impressive, there's little characterization and the story itself is too slight to justify a feature length film. There are long stretches with characters dancing, frolicking, chasing and bickering. Since this one has even fewer title cards than Little Annie Rooney, we seldom know specifically what everyone is squabbling about. In fact, it's a long time before anything resembling a plot reveals itself: Pickford plays a local young outcast who lives with her grandmother, whom everyone in the nearby village thinks is a witch. Things get complicated when she falls for a local boy who's already engaged. During the duller stretches - and there's a lot of 'em - I found myself trying keep a sharp eye out for Milton Berle, who was seven at the time and supposedly appeared in the film. I never spotted him, though. 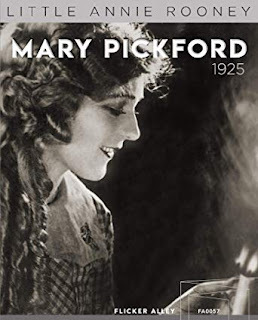 It goes without saying every self-respecting cinephile should check out at least one Mary Pickford film before they die. After all, she was the era's biggest movie star. Of these two initial Blu-ray releases, Little Annie Rooney best showcases her talent, while Fanchon the Cricket is too shapeless to leave any kind of impression. LITTLE ANNIE ROONEY also includes a brief featurette in which musician Andy Gladbach (who looks about 12) discusses the challenge of creating new music for a century old film.